Note: I wrote this post for the Business Learning Institute blog in February 2015, shortly before the eye-opening book When Millennials Take Over was published. Written by Jamie Notter and Maddie Grant, the book makes a fascinating claim: The conversation we’ve been having about millennials is misdirected. Instead of talking about differences between the generations, Notter and Grant say we should be talking about how millennials are going to change the ways we do business going forward. This is an important book with an important message, and on May 25, we’re bringing that message directly to MACPA members. Notter will present the latest in our BLI Thought Leader Series, titled “The Millennial Generation and the Future of Business.” The event will be offered live from 9 a.m. to 12:30 p.m. on May 25 at the Sheraton Columbia Hotel. It also will be offered via simulcast at the same time. Register today. In the meantime, read my review of Notter’s and Grant’s fantastic book below. Let me guess. Entitled. Annoying. Self-centered. Blameless. Narcissistic. Impatient. That’s what the generational “experts” and workplace dinosaurs would have you believe. They’ve been beating those dead horses for so long now that we all kind of believe them, don’t we? All evidence to the contrary. In fact, every generation annoys the hell out of the ones that came before. Millennials are no different on that score, so spare me your “Why can’t they be more like us?” whining. The truth is, a revolution is coming, and millennials are leading the charge. Ignore it at your peril. 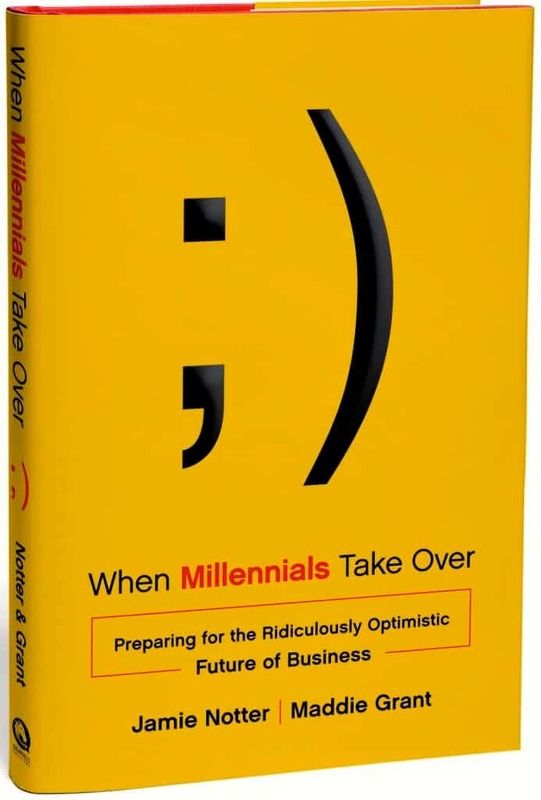 That’s the message behind the brilliant new book When Millennials Take Over: Preparing for the Ridiculously Optimistic Future of Business. Written by Jamie Notter and Maddie Grant (the same duo who brought us Humanize), the book warns us that most generational conversations miss the point. We’re not talking about us-vs.-them. We’re talking about the very future of business — and the dawn of what could be a historic new era for mankind. The first is the social Internet and its impact on business. The social movement, they argue, has shifted power from institutions to individuals, and that spells trouble for traditional business models that rely on the centralization of power and control. “The more that individuals experience the new power that the social Internet is delivering, the more confused and frustrated they become trying to operate in traditional bureaucracies and hierarchies,” Notter and Grant write. Count millennials among the most frustrated. They were born into a social world. It’s all they know. And now they’re working for hopelessly outdated organizations that either don’t get or refuse to acknowledge the social movement. No wonder they’re frustrated. But they won’t be frustrated for long. By 2020, millennials will be the largest segment of the U.S. workforce, “just as they are ascending into management positions,” the authors write. When that day comes, millennials will change business to work the waythey do — and the coming shift in management and leadership will be nothing short of transformational. The second factor is this: Mankind appears to be on the cusp of a new, transformational era. Notter and Grant cite the work of researchers William Strauss and Neil Howe, who have tracked generations through the ages and determined that “once every four generations in this country, there is a major transition which has a deep impact on our national culture, politics, and economy.” From the Revolutionary War of the 1770s to the Civil War of the 1860s to the Great Depression and World War II, major transitions have occurred in this country roughly every 80 to 100 years. “Here’s where it starts to get even more interesting,” Notter and Grant write. “If you skip ahead 80 years from the Depression and World War II, you end up in the present. … The millennial generation (is) entering young adulthood during … a time that history predicts will be yet another significant transition, from one era to the next. Digital — embracing the tools and mindsets of the digital world. Clear — an increased and more intelligent flow of knowledge and information. Fluid — expanding and distributing power in a dynamic and flexible way. Fast — taking action at the precise moment when action is needed. Still, those discussions must start with an understanding of this basic truth: The world is changing, and millennials are driving that change. The question is this: Will you gripe your way to irrelevancy, complaining about all of the old millennial stereotypes? Or will you embrace this as an opportunity to position your organization for future success? While you’re thinking, read When Millennials Take Over. It’s a thought-provoking blueprint for success in a millennial world. And make no mistake: For the next decade or two, this world belongs to the millennials.